Quite an anomaly in last night’s Oriole game. 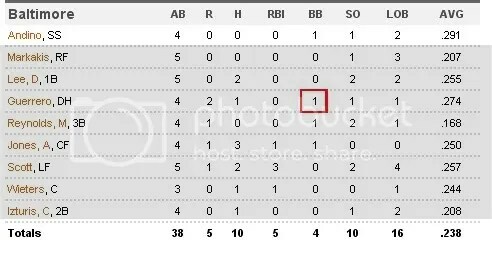 No, Nick Markakis didn’t hit a home run, unfortunately. What did happen though, was even more surprising. 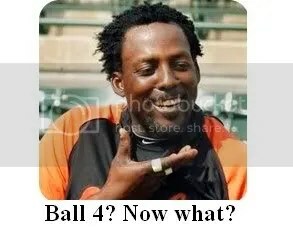 That’s right, leading off the top of the 6th inning, Vlad Guerrero…walked. It was Vlad’s first base on balls this season and it came in his 116th at bat, a Birdland record to begin a season. A few batters later, Vlad would come around to score after ill-advisedly taking off like a bat out of hell from second base on Adam Jones’ bloop single that barely cleared Royals’ second baseman Dusty Getz’s glove. Vlad lucked out, but was just inches from being doubled up had Getz reached just a fingertip further. Despite Vlad’s “efforts,” the O’s dropped this one in 10 innings to Kansas City, 6-5. Yes, they lost to the damn Royals. And no, I don’t care that KC is 16-13 and has 13 home wins, tied with Cleveland for the most in the AL. They’re still the Royals, one of the most forgotten franchises in sports. Losing to them is unacceptable for a team trying to turn its fortunes around. If the O’s can’t manage to rebound and take two of three at Kauffman Stadium before coming home to face the red hot Rays, then this entire road trip can be chalked up as one big steaming pile of FAIL. Jake Arrietta and Chris Tillman take the hill Wednesday night and Thursday afternoon, respectively, for the Birds. This entry was posted on May 4, 2011 at 8:32 am and is filed under News, Orioles. You can follow any responses to this entry through the RSS 2.0 feed. You can skip to the end and leave a response. Pinging is currently not allowed.